This content is not provided or commissioned by the issuer. Opinions expressed here are author’s alone, not those of the issuer, and have not been reviewed, approved or otherwise endorsed by the issuer. 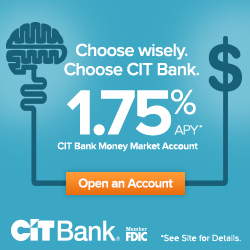 This site may be compensated through the through our partnership with Citi. Learn more on our Advertising Policy. -One of the nation's top rates — over 11x the national average. I opened a savings account back in August 2016 for 25k based on a promo for 300 dollars. Now Citi is saying the promo didn’t exist. Can someone help me with the code or more info on this? I used the link and set the account up.